My main research area is logic. I am especially interested in nonclassical logics, including relevance and substructural logics, modal logics, combinatory logic and λ-calculi. Nonclassical logics were first introduced as a solution to philosophical problems such as the problem of implication and entailment. Later on, new logics emerged in other disciplines too — from mathematics to computer science and linguistics. Some of my research interests — beyond logic and the philosophy of logic — are connected to the latter areas. I have a keen interest in the philosophy of mathematics, in particular, in the foundations of mathematics. I also try to follow the latest developments in the philosophy of computer science and informatics, especially, those that concern questions related to theoretical computer science — like algorithmics, programming language design, information theory, complexity theory and cyber security. Earlier, I worked on some questions in the semantics of natural languages, primarily, using modal (specifically, temporal and tense) logics and discourse representation theory. A more precise characterization of classes of structures for various nonclassical logics leads straightforwardly to topological frames. I proved topological duality theorems for ortho- and De Morgan lattices and for the algebra of the logic of entailment. These duality theorems provide plenty of insights into the logics themselves, because interpretations are maps in a category. Combinatory logic and λ-calculi are connected to other nonclassical logics in various ways, one of which is the Curry–Howard correspondence (CHC). J. Michael Dunn and I wrote a paper about extracting combinatory inhabitants from proofs in a sequent calculus for implicational ticket entailment. This is a first step to extend CHC into a new direction. Certain combinatory terms are equivalent to proofs in various nonclassical logics; therefore, the question of decidability turns into the question of inhabitation. Combinatory logic in itself is an elegant and powerful formalism that can represent computable functions — just as Turing or register machines and Markov algorithms can. 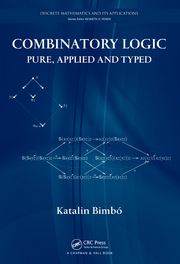 A book on combinatory logic that I wrote appeared a couple of years ago. The proof theory of nonclassical logics sometimes gets really tricky. The original sequent calculi LK and LJ are seemingly simple proof systems, but in reality, the proofs are tightly controlled — as evidenced by the cut theorem. Some well-known relevance logics cannot be formalized as extensions of the associative Lambek calculus, which causes various “technical complications.” I succeeded in defining sequent calculi for some of these relevance logics together with proving the cut theorem for them. A major research project that I and J. Michael Dunn worked on (as a SSHRC SRG), was the problem of the decidability of the implicational fragment of ticket entailment, which remained open for over 50 years. Our decidability proof was made possible by a new sequent calculus for implicational R, which extends a sequent calculus for implicational T by two rules that add exactly what the difference between these logics is. 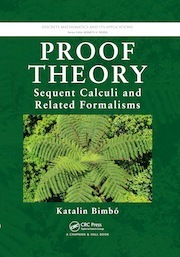 I wrote a book on proof theory with a focus on sequent calculi (including some tableaux and resolution systems), which was published in 2014. Then, I proved the decidability of MELL (the multiplicative–exponential fragment of linear logic). J. Michael Dunn and I proved the decidability of several modal relevance logics. Last year, I proved another group of modal logics (“semi-lattice based modal logics”) decidable. I am certain that logic — together with its many connections and offsprings — is an exciting and thriving field of research. I received a Faculty of Arts Research Excellence Award in 2012. K. Bimbó, “Inhabitants of intuitionistic implicational theorems,” in Logic, Language, Information and Computation. Proceedings of the 25th International Workshop, WoLLIC 2018, Bogota, Colombia, July 24–27, 2018., L. S. Moss, R. de Queiroz and M. Martinez (eds. ), Lecture Notes in Coputer Science, vol. 10944, Springer, 2018, pp. 1–24. K. Bimbó and J. M. Dunn, “Larisa Maksimova’s early contributions to relevance logic,” in Larisa Maksimova on Implication, Interpolation and Definability, S. Odintsov (ed. ), Outstanding Contributions to Logic, vol. 15, Springer Nature, Switzerland, 2018, pp. 33–60. 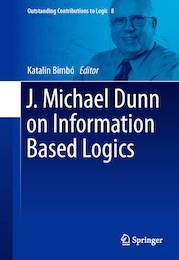 K. Bimbó and J. M. Dunn (eds. ), Proceedings of the Third Workshop, May 16–17, 2016, Edmonton, Canada, special issue of the IFCoLog Journal of Logics and their Applications 4(3) (2017). K. Bimbó and J. M. Dunn, “The emergence of set-theoretical semantics for relevance logics around 1970,” in Proceedings of the Third Workshop, May 16–17, 2016, Edmonton, Canada, K. Bimbó and J. M. Dunn (eds. ), special issue of the IFCoLog Journal of Logics and their Applications 4 (2017), pp. 557–589. K. Bimbó, “Some relevance logics from the point of view of relational semantics,” in Israeli Workshop on Non-classical Logics and their Applications (IsraLog 2014), O. Arieli and A. Zamansky (eds. ), special issue of the Logic Journal of the IGPL 24 (2016), pp. 268–287. K. Bimbó, “The decidability of the intensional fragment of classical linear logic,” Theoretical Computer Science 597 (2015), pp. 1–17. K. Bimbó, “Current trends in substructural logics,” in JPL40: The fortieth anniversary issue of the Journal of Philosophical Logic, J. Horty and F. Veltman, (eds. ), special issue of the Journal of Philosophical Logic 44 (2015), pp. 609–624. K. Bimbó and J. M. Dunn, “Extracting BB'IW inhabitants of simple types from proofs in the sequent calculus LTt→ for implicational ticket entailment,” Logica Universalis 8(2) (2014), pp. 141–164. K. Bimbó and J. M. Dunn, “Calculi for symmetric generalized Galois logics,” in A Festschrift for Joachim Lambek, J. van Benthem and M. Moortgat (eds. ), Linguistic Analysis, 36 (2010), pp. 307–343. K. Bimbó, “Schönfinkel-type operators for classical logic,” Studia Logica 95 (2010), pp. 355–378. K. Bimbó and J. M. Dunn, “Symmetric generalized Galois logics,” Logica Universalis 3 (2009), pp. 125–152. K. Bimbó, “Functorial duality for ortholattices and De Morgan lattices,” Logica Universalis 1 (2007), pp. 311–333. K. Bimbó, “LEt→, LR°ˆ˜, LK and cut free proofs,” Journal of Philosophical Logic 36 (2007), pp. 557–570. K. Bimbó, “Admissibility of cut in LC with fixed point combinator,” Studia Logica 81 (2005), pp. 399–423. K. Bimbó, “Types of I-free hereditary right maximal terms,” Journal of Philosophical Logic 34 (2005), pp. 607–620. K. Bimbó, “Semantics for dual and symmetric combinatory calculi,” Journal of Philosophical Logic, 33 (2004), pp. 125–153. K. Bimbó, “Semantics for the structurally free logic LC+,” Logic Journal of IGPL, 9 (2001), pp. 525–539.